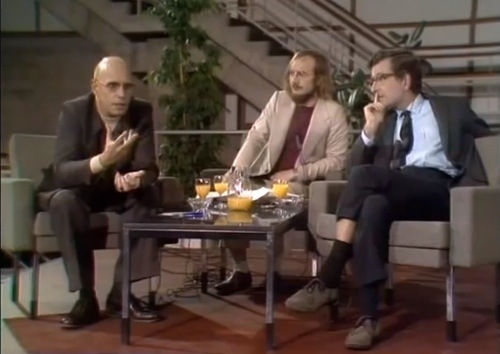 Excerpts from the Foucault-Chomsky debate on human nature and power have circulated online for years — now it’s available in full for the first time. In 1971, with the Vietnam war in full swing and radical social movements destabilizing the social, political and cultural order throughout the Western world, Dutch philosopher Fons Elders invited two of the world’s leading thinkers — the American linguist and activist Noam Chomsky and the French social theorist Michel Foucault — to debate a thorny and perennial question: is there such a thing as an “innate” human nature, and if so, what are its implications for our ideas about power, justice, revolution, and the shape of the ideal human society? The resulting dialogue has been described as one of the most original, provocative, and spontaneous exchanges to have occurred between contemporary philosophers, and above all serves as a concise introduction to their basic theories. What begins as a philosophical argument rooted in linguistics (Chomsky) and the theory of knowledge (Foucault), soon evolves into a broader discussion encompassing a wide range of topics, from science, history, and behaviorism to creativity, freedom, and the struggle for justice in the realm of politics. Hoping to puncture the prim sobriety of the Dutch audience, the program’s host, Fons Elders, a professed anarchist, had obtained a bright red wig, which he tried, unsuccessfully, to convince Foucault to wear. Meanwhile, unbeknownst to Chomsky, Foucault had received, in partial payment for his appearance, a large chunk of hashish, which for months afterwards, Foucault and his Parisian friends would jokingly refer to as the “Chomsky hash.” (Ibid., p. 201, hat tip to Aphelis for this quote). Excerpts from the video of the debate — which was broadcast on Dutch television — have been circulating online for many years, and a book with a (rather liberally) translated transcript of the discussion has been published and republished many times. More recently, however, a full video of the debate has surfaced, allowing ROAR, in collaboration with a group of Dutch anarchists, to assist in a new translation of the debate. With this project completed, we are proud to share the first version of the full Chomsky-Foucault debate with English subtitles. Special thanks to Anarchistische Groep Nijmegen. Translations from Dutch by withDefiance and Tamara van der Putten; translation from French by Tamara van der Putten. N.B. Hit the ‘captions’ button if the subtitles don’t show up. Noam Chomsky (1928): linguist, historian, philosopher, critic and political activist. As the “father of the modern science of language” (linguistics), Chomsky focused on the issue of the innate versus the learned. Over the course of his career, Chomsky evolved into a major critic of US foreign policy (from Vietnam to South America and the Middle East) and the propaganda of the mass media. One of his major works is ‘Manufacturing Consent: The Political Economy of the Mass Media’, co-written with Edward S. Herman. Chomsky continues to write prolifically today. Michel Foucault (1926-1984): French philosopher, social theorist, historian and literary critic. In his work, Foucault dealt with the issue of power and how it works in practice; how it influences knowledge; and how it is used as a form of social control. Foucault is best known for his critical studies of social institutions such as psychiatry, social anthropology, the penitentiary system and the history of human sexuality. His works are still very influential in academic circles. One of Foucault’s major works is ‘Discipline and Punish: The Birth of the Prison’.